Lightly grease cookie sheets. 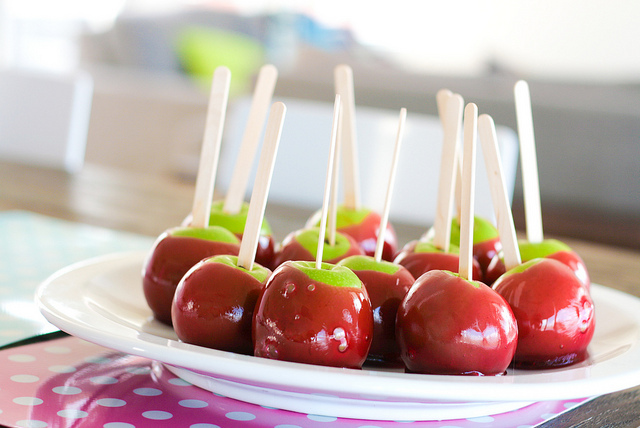 Insert craft sticks into whole, stemmed apples. In a medium saucepan over medium-high heat, combine sugar, corn syrup and water. Heat to 300 to 310 degrees F (149 to 154 degrees C), or until a small amount of syrup dropped into cold water forms hard, brittle threads. Remove from heat and stir in food coloring. Holding apple by its stick, dip in syrup and remove and turn to coat evenly. Place on prepared sheets to harden.